Choosing headphones is confusing. Some sets are tuned to get the bass pumping during your workouts. Others are better suited to quietly enjoy classical music. And every manufacturer has its own idea of what sounds “best”. But what if you could tune the sound to your liking without the need for an equalizer? That’s what Reid Heath Acoustics (RHA) is aiming for with its new $200 T10i. 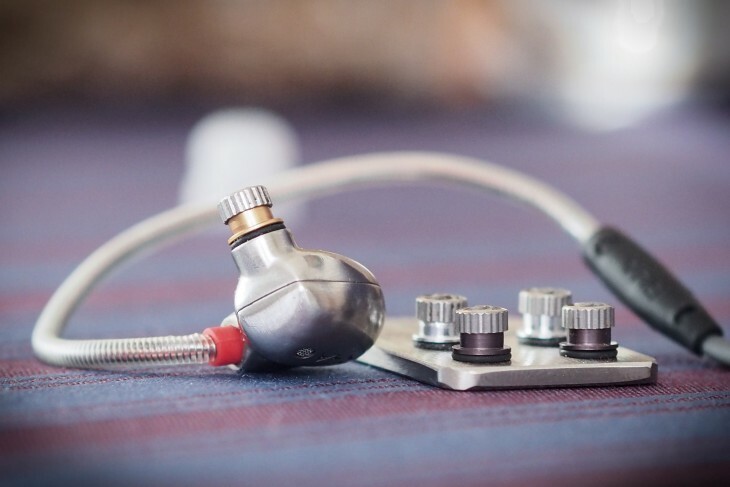 We’ve been fans of RHA’s headphones before; couple this with an injection-molded steel build and a 3-year warranty and you’ve got our attention. RHA’s headphones have always been strong on the design front, beginning with the packaging and accessories. The T10i kicks it up a notch. Inside the box – other than the headphones, of course – you’ll find a selection of several silicon and foam tips that should help you find a good fit. Also included are the three color-coded sound-tuning filters (more on them later) and a leather carrying case to hold all the included items. It’s not often earphones can be described as “beautiful,” but the T10i earn the designation. Crafted through an injection-molded steel process, the T10i look and feel almost handmade. The bulbous, form-fitting shape rests comfortably in your ear; I was able to sleep with them on with no issue. The most unique design point is the ear hook. The hooks are soft and springy, but you can actually mold them to a shape that best fits around your individual ears. Not everyone likes wearing earphones over-the-ear, but I prefer mine that way for the added stability when working out. The hooks are necessary too, since the earpieces are quite heavy on their own. But that’s just a testament to their build quality. The T10i features the same thick cable used on the MA750i, which is mainly a good thing. The y-split and connector are both machined out of metal as well, and the connector has a reassuringly sturdy spring strain relief. There are three buttons and a mic; as expected, only the play/pause button and microphone work on my Android devices. The headphones don’t feature any fancy noise-cancelling circuitry, but they did a great job of blocking outside noise, even as the turbines roared and babies cried during my flight to CES. The foam tips work particularly well if isolation is your priority (although it’s worth noting they slightly soften treble). I only have two complaints: First off,the cable’s rubbery texture (read: lots of friction) makes it hard to untangle. Because the cable is so thick, it doesn’t tangle often in the first place, but it’s a little irksome when it does. Second, I wish the cables were detachable as on some competitors at this price point, but that’s largely forgivable given the top-notch build and 3-year warranty. Reviewing the T10i is somewhat like reviewing three headphones – the three tuning filters will cause the headphones to vary slightly for different audiences. I was happiest with the sound from the treble filters, so that’s what I’ll be describing in general, but changes are subtle enough that there is still a common sound signature for all configurations. As a note, I let the headphones “burn-in” for several hours before making definitive assessments. Whether headphones and speakers actually need to be broken in to perform optimally is a highly debated matter, but I prefer to let mine settle just in case. The first thing you notice about the T10i is that these are bass-powerhouses regardless of what filter you’re using. You’re unlikely to be left wanting for stronger kick on a bass heavy R&B track like Janelle Monae’s “Primetime“. At the same time, it’s high quality bass, textured enough to realistically depict the rumble of a church organ’s sub-bass on something like Bach’s “Toccata and Fugue“. The midbass response is stronger than I generally prefer, lending a certain thickness to the sound. While a heavy midbass is fun on pop tracks, it has a tendency to overwhelm texture and detail in other frequencies, which is why many audiophiles bawk at some popular products tuned for the masses. What impresses me about the T10i, then, is that they have just as heavy a midbass as other headphones while maintaining the details you’d expect from an audiophile-grade product. The midrange generally comes off well-balanced with respect to the other frequencies. Hayley Williams’ voice in Paramore’s “Ain’t it Fun” comes through powerfully. Rock tracks with with more aggressive basslines may suffer more from the headphone’s tuning, however. The treble (especially with, well, the treble filters) is well extended, giving cymbals in Daft Punk’s Get Lucky a realistic amount of shimmer. It might come off slightly harsh if you’re sensitive to sharp sounds when using the treble filters, but one of the other filters or using the foam eartips should mitigate this. Despite having slightly thicker bass than the MA750i to my ears, Rodrigo and Gabriela’s strumming on The Soundmaker sounds wonderfully defined. As with the MA750i, the T10i are surprisingly good at making music sound like it’s not completely stuck your head, with orchestral music providing a three-dimensional soundstage – a relatively rare feat for bass-heavy in-ear monitors. Perhaps my favorite aspect of the T10i is how well it reproduces an instrument’s timbre, most aptly with the treble or reference filters on. This is likely a result of the thick steel housings eliminating unwanted resonances. Speaking of the filters, RHA isn’t the first to try something of the sort, but it’s still a relatively rare feature. Don’t expect them to provide any drastic change, but rather a mild shift towards their respective tuning. The headphones come with the ‘reference’ filters applied by default, which provide a pleasant bassy sound balance, but I actually think the treble filters are closer to a median point anyone can enjoy. I’d rather see the reference sound become the bass one. I don’t think many will need more thump than those provide, and in any case the bass filter seems to behave more by decreasing treble further than actually increasing strengthening the low end. Instead, I’d rather there be a new, brighter option be created for treble-lovers. Still, it’s much nicer to have the option to tune the sound than not at all. There’s a lot to like about the T10i. I wouldn’t consider them quite the amazing deal the MA750i offer at $129 for the average listener, but to more serious audiophiles, the sound quality upgrade is obvious. I do still wish they were tuned to be ever-so-slightly less bassy – I suspect many discerning listeners willing to spend this much would rather this be the case as well – but there’s no denying the output is high quality regardless of your sound preferences. The build is among the best I’ve seen for any headphone, including full-size over-the-ear headphones, and the long warranty only adds extra reassurance. Any nitpicks aside, it’s not often you come across headphones that so well combine the trifecta of sound, build and convenience. Though not inexpensive, RHA’s T10i earphones are a truly luxury product without an outlandish price.